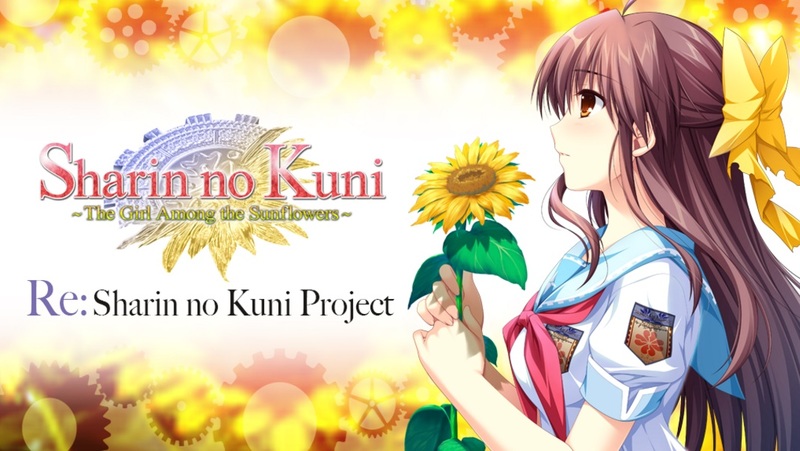 Tokyo Otaku Mode and Frontwing have announced that the Re;Sharin no Kuni: The Girl Among the Sunflowers Kickstarter project will be going live tonight, November 21st, and will have various promotions to go along with it as it tries to meet the $80,000 goal, such as a Reddit “Ask Me Anything” planned at 6PM on November 23rd on /r/visualnovels where you can ask Tokyo Otaku Mode and Frontwing any questions you may have about this project, and other PR events to be revealed in the coming days. This Kickstarter project in particular is for the localisation of one of the most critically acclaimed visual novels of all time, Sharin no Kuni, Himawari no Shoujo for PC. There will be an all ages version and an 18+ version with mosaics, as well as a DRM-free DVD-ROM release. Frontwing will be handling the localisation (taking inspiration from the fan translation) in conjunction with the game’s IP holder AKABEI SOFT2, with Tokyo Otaku Mode handling the Kickstarter. For $30 you can get onto BackerKit and obtain a digital copy of the game for Steam. $40 will net you a physical copy of the game, as well as a thank you letter. For $85, you can get the “Fairy Tale Friends” tier which includes a physical game, artbook and soundtrack. There are also digital equivalents for each of these tiers as well, as well as “Early Bird” discounts. Other rewards include t-shirts, pin badges, dekimakuras, laptops or a tour of Akihabara with AKEBEI SOFT2 and Frontwing if you back the highest possible tier. There are several more rewards as well, so it’s worth checking out the Kickstarter page at the bottom to see the whole list. A society which imposes special “Duties” upon everyone who breaks the law. The individuals who oversee these criminals’ rehabilitation are the “Special Elite”ーa rank the protagonist, Kenichi Morita, hopes to attain. To do that, he must pass his final exam, for which he arrives at a certain country town. At the school Kenichi attends, he encounters girls bound by various “Duties.” Those obligated “to observe a 12-hour day” are forbidden from being awake for more than 12 hours per day, and those obligated “to remain in infancy” cannot grow up. It is meeting Natsumi Hinata, the girl who “cannot fall in love,” that throws him out of gear. Soon, Kenichi makes a series of odd discoveries… his own grave, erected secretly on a clifftop; his patrimony, hidden deep inside a cavern. Kenichi finds that he must search for his own atonement in this dystopian society. What is the truth behind the Land of the Spinning Wheel? Discover for yourself through Kenichi’s eyes! A touching story with a deeply profound message, depicted with a serene touch and moments of lighthearted comedy, this visual novel is an experience not to be missed, for both old fans and new! Here is the game’s opening movie (in Japanese). Additionally, there is a message from AKABEI SOFT2 that you can watch below. $120,000 – Physical and digital PS Vita release, with the ability to swap the PS Vita version in place of the PC version as well as becoming an odd-on. They are also in talks with an experienced publisher over what to do if the Vita stretch goal is met. If you want to back the project, you can do so by going here when it goes live tonight, November 21st at 6PM Pacific Time. Alternatively, you can follow the official Twitter account for this project here.